But bear in mind again, jb-x86 is still under test release stage at the moment. One I problem I had was jb-x86 went unstable and whole system blackout while I was connecting my WIFI access point in the one time Android setup wizard welcome screen. How I bypass it is by skipping it not to connect the WIFI first. Connect the WIFI later manually after I finished the setup wizard. 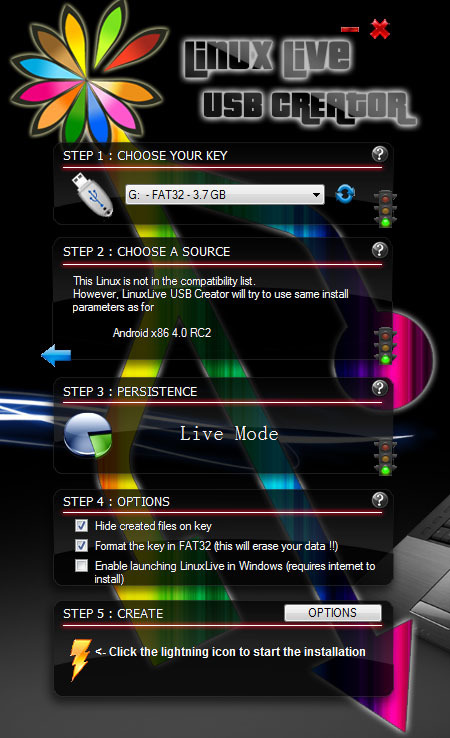 Download LinuxLive USB Creator (LiLi) and install. STEP 1 : CHOOSE YOUR KEY - Select your flash drive. STEP 2 : CHOOSE A SOURCE - Click on ISO / IMG / ZIP and pick android-x86-4.2-20121225 iso. LiLi will use Android x86 4.0 RC2 install parameters to create. STEP 3 : PERSISTENCE - Just leave it default. STEP 4 : OPTIONS - You may check or uncheck the boxes according to your preferences. These will not affect jb-x86 installation. STEP 5 : CREATE - Click on the lightning icon to start the installation. Before loading BIOS, choose your flash drive to boot first. Usually by pressing ESC or F10 key, you may have to refer your computer's manual guide. Select Installation - Install Android-x86 to harddisk if you wish to install. Partitioning page appears, you may choose an existing partition or create a partition to install jb-x86. You can also install jb-x86 on USB flash drive. On filesystem page, choose Do not format to avoid the partition from formatting. Otherwise, choose a filesystem type to format. Select Yes to install boot loader GRUB in order to be able to boot jb-x86. After installation is completed, Hit Reboot. Done. 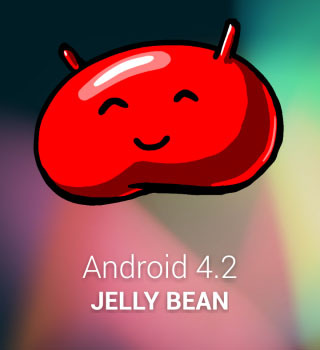 Android-x86 4.2.1 Jelly Bean is up and running. Please read here if you wish to uninstall Android-x86 and GRUB Loader. Well, It goes to black screen after i add google account. It happens on my laptop too. How I avoid the black screen is not to connect Wifi first during the setup wizard and then connect Wifi after the steup wizard is finished. with this instructions... wifi it's functional???? Best case: Try booting in VGA (VESA?) mode. Now it should work (I guess...) . Try booting with debug mode. When the screen "freezes" first time, type "exit" . Do a second time when it "freezes" again. If it really got stuck on that line, well... else, SurfaceFlinger is crashing. Some low-level libc.so abort stuff I had when running it on a PC. Not always. If you have got a Broadcom wifi card that needs some special firmware (ucode shall ring in your memory) as me, you need to install android-x86 with system partition READ-WRITE (RW) (!) to copy the needed files to /lib/firmware/... in debug mode (guessing you know how to mount /dev/sdXY being your USB dongle / ...). As next you reboot into debug mode, first screen you do "modprobe b43". Second screen you just exit as usually, now you have got a functional WIFI-card (driver-side). Android will have problems finding and using it. I had to try out 9001 methods for 1 hour and got internet for 15 minutes (well... darn KERNEL PANIC). I got stuck at the root prompt, too, and tried booting in debug mode. Now I am seeing a scrolling list of SurfaceFlinger segfault at deadbaad. My hardware is a MSI AE2220. Yeah, I tried the same thing n got passed setup screen. But If I add google account later, the black screen ll come up.